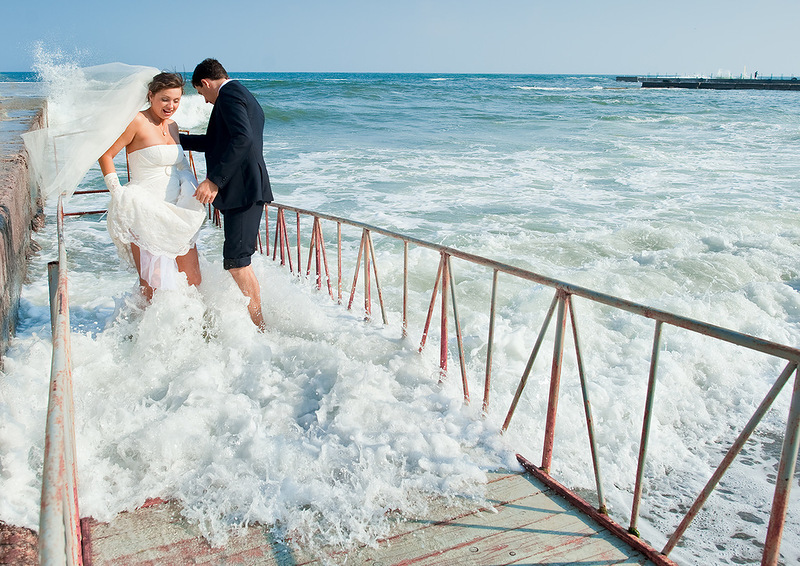 Many couples, especially the female part, dream of a beautiful beach wedding. As they come with their own special set of considerations, we would like to maintain some tips for a beautiful beach wedding. Your wedding day has to be extraordinary and therefore, no stress is allowed. Here is our set of tips for your worry-free exchange of vows at the beach. When planning a wedding at the beach, the bride definitely has to forget the huge ball gown – it does not belong to a beach. A beach wedding is something light and breezy, not balky; that is why, you also need to dress like this. Walking on the beach is much easier without a large dress. A good alternative is a dress made off lightweight fabric like chiffon or charmeuse. That way the gown is able to flow in the ocean breeze. What else women have to ditch are the heels. You should never mix high heels with the beach. Flat-sole sandals might work instead as they do not sink into the sand. The bride may even go without shoes. You should also prepare your guests! They should not wear black, a wedding – especially at the beach – is a joyful event! Men and even the groom do not need to wear a jacket and might go in beige for example. As you are marrying at a beach, there is no need for messy decorations. You beach already is beautiful. This is why you should rather highlight the natural beauty. The decor should be simple to not go over the top. Your wedding can be about shells, starfish and other maritime themes. Inspiration should always be the nature, where you can find harmonious color palettes of sand, stones or water. Yet, a good idea is to add a color that creates contrast to the sand. Photos are absolutely necessary at your wedding day. You want to remember the special moments of the day and have some great pictures of the bridal couple. As you are marrying outdoors, you need a photographer with a lot of experience. The photographer has to be familiar with the proper lighting techniques. If this is the case, he or she is able to take advantage of the beauty of your natural surroundings. What might be part of your photos are waves crashing in the distance and the perfect sunset. As your location and wardrobe are light and breezy, your photos could reflect this atmosphere, too. You may kick the sand or simply stroll hand in hand. Whatever ideas you have, make sure to make them reality and have unique photos. Our last tip for a beautiful beach wedding is the right destination. You should choose a private beach or marry from Monday to Thursday, so that the beach is not as crowded as on Friday, Saturday and Sunday. It is furthermore important, that you find a beach you feel comfortable with. There are many kinds of beaches, from cliffs to long sandy beaches or even pink beaches. You need to know, that your chosen beach is perfect and reflects you as a couple. Some lovely beaches may be found in Mexico, Grenada or Curacao. At Curacao you may like the popular Hotel Kura Hulanda with the 74-room Lodge Kura Hulanda & Beach Club. Just see yourself. Whether you are planning a destination celebration or a marrying at a sandy spot close to your home, you need to remind yourself of the lightness of a beach wedding and you will enjoy a beautiful day with your loved one at a beautiful beach. Just say ‘I do’.